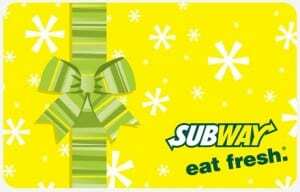 Remember a while back when we posted that you can score a free $5 Subway gift card from My Miles Matter? (no longer available). I just got an email from them asking to confirm my email. It was just a link you had to click. Basically if you don’t by 2/19, then your account is deactivated and you forfeit the gift card. If you click on “my redemption history” once you log in to their website, it also says that the $5 subway gift card is on backorder. Just an FYI for all of the lucky ones that were able to get it!